He was a senior. She was a sophomore. Only two grades separated the two, but they weren't exactly compatible back in their high school years, at least as far as high school standards are concerned. Think, wrestling meets choir. It wasn't until almost ten years later, after stumbling into one another at church, that Ty asked Darci out to lunch. She said yes. It didn't take long for them to realize just how much they have in common. Still, things needed some time to work themselves out a bit. Darci moved away to Virginia and it seemed that their relationship had met its end. But isn't that often when the harmony finds its way back in? That's how it worked for these two, and he asked her to marry him. She said yes. We drove up to McConnell's Mill for an engagement shoot and it was such an amazing location. Fortunately for us, the threatening weather was cooperative and the rain held off. I'm beginning to love overcast days actually; the light is so creamy and consistent--ideal for shooting. Despite Ty's initial disclaimers that he is not comfortable in front of the lens, photographing these two was perfectly natural and fun. I loved what I saw behind my camera, and it's largely because of how comfortable Darci and Ty are together. We captured so many gorgeous images, but here are just a few of my favorites. 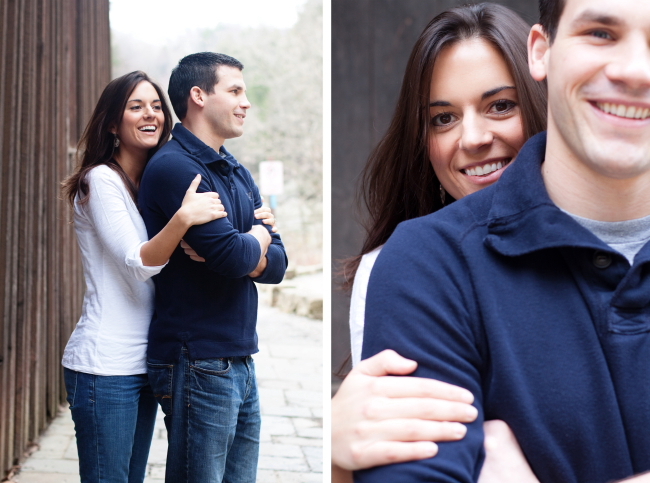 I'm very much looking forward to photographing their beautiful wedding in June when... She'll say "I do."